Whether you’re new to running or doing your 10thmarathon, all professional and recreational athletes can benefit from having a massage as part of their training routine. Why do I need a sports massage? What is the difference between sports and remedial? How often should I come in for a massage and…. So whether you play sports which involve running or just like to run, here is our quick guide to sports massage for runners…. Sports massage for runners is a great way to help speed recovery time, help prevent and manage injuries as well as reduce muscle pain and soreness (1, 2). It’s particularly good for runners because running involves a sustained repetitive contraction of particular muscles for a time. Over time, this repetitive movement can lead to the shortening of muscles (and fascia) and joint strain. Improve immune function and reduce inflammation (4). Medibank Private describes remedial massage as the “systemic assessment and treatment of the muscles, tendons, ligaments and connective tissues of the body to assist in rehabilitation, pain and injury management” (5). I prefer to look at it as a holistic treatment which looks at all aspects of the body and what’s causing the issue or pain. Treatments must take into consideration the mental, emotional, physical and environmental state of being of the client. For example, if you have tight neck and shoulders, we would talk about if stress is a factor and how you deal with stress in life. Additionally, things like posture, what extra-curricular activities you might be doing and desk ergonomics can also play a part, so it’s important to look at that as well. Sports massage, is a style of massage that falls under the remedial massage definition. It is more specifically tailored to an individual’s sporting training regime. For example – for runners, we would focus more on working through the legs and glutes. However, if a swimmer came in, it would be more logical to work thorough the upper back, pecs and lats. A good therapist can also include therapist-assisted stretches in the session. And they can also offer advice on what stretches or exercises you need to do in between sessions as well. Don’t forget, sports performance can be affected by both physiological and psychological factors. Many professional athletes have a team of people around them, to help make sure that they are always performing their best. A sports massage doesn’t necessarily mean that it’s going to hurt! Usually when someone hasn’t had massage in a while and comes in after training for months, yes, it might hurt a bit. Or, if you’re carrying an injury and need some rehabilitation work done, it might be a little painful. But in most circumstances, the opposite effect is the desired outcome. We want to make sure that you’re feeling good after a treatment with us and not bruised and battered! So, depending on where you are in your training cycle and if it’s a pre- or post- race massage, the therapist will adapt their style and pressure to make sure that they are not going to impede your performance or cause more injury to your muscles. When is the Best Time and How Often Do I Need A Sports Massage? It’s important to realise that massage works best as a preventative treatment and when done regularly, it can help in many ways. The best thing to do is to work with a therapist who gets to know your body over time. Having frequent tune-ups are a great way to keep on top of any niggles before they become serious. Ideally, if you are just getting into training – as a newbie or someone who has just had a break after your last big race, this would be the perfect time to come in. In fact, for the newbies – Dawson & colleagues have shown that regular massage can help novice runners to meet their target goals (6). Depending on your training schedule, as you ramp up the training, I would suggest that you come in more regularly – perhaps on a weekly or fortnightly basis. If you’re doing a hard training session or long run, it’s a good idea to get a massage one or two days before your training run, or the day after. We also suggest having an active rest day the day after the massage. Exercises like walking yoga, pilates or swimming can complement your training program. Pre-race massages are important just to keep things flowing. 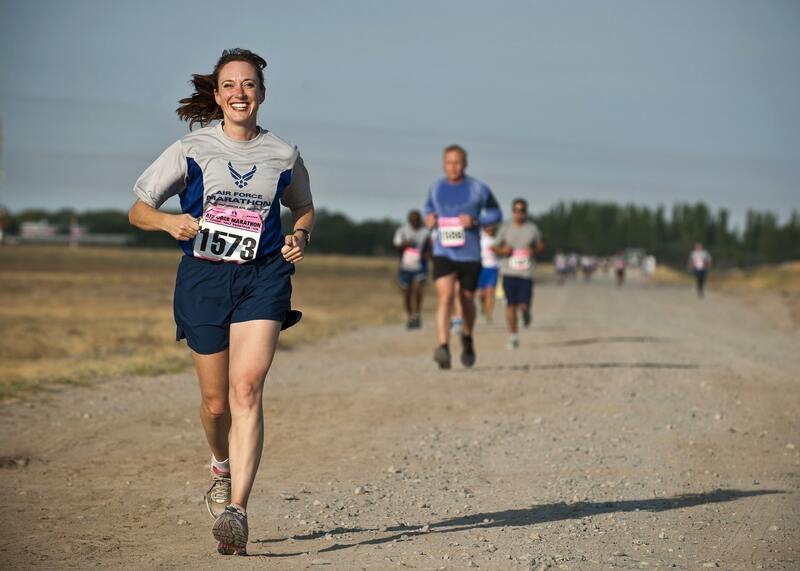 Schedule your treatment 2-5 days prior to the race. You don’t want to have a massage that’s too hard just before race-day, in case it’s too much for your muscles. And after you’ve raced, a post race massage can really help with recovery. So give it any time from that day or a day or two after your race to get the full benefits. Having a bath with Epsom salts after your race can also help with muscle recovery. Who Should I See for My Sports Massage? It’s best to see someone who is a qualified remedial massage therapist who understands training and training cycles. As a part of the Diploma of Remedial Massage, we learn about sports injuries and treatment as well as exercise therapy. This includes things such as therapist assisted stretches and fit ball / therapy band exercises. At Sydney Remedial Massage, we are all experienced therapists who have worked with professional athletes as well as social athletes. If you have any questions about who the best therapist is for you, please feel free to contact us or call us to find out more. Heapy AM1et al. A randomized controlled trial of manual therapy and pneumatic compression for recovery from prolonged running – an extended study. Res Sports Med.2018 Mar 7:1-11.